Rinseless washing just got even safer for your paint. The Optimum No Rinse Two Bucket Wash System combines Optimum's high lubricity No Rinse Wash & Shine with the paint-saving two-bucket system. You can now wash your vehicle with ONR with the piece of mind that you're taking extra steps to protect your vehicle from swirls. If you haven't tried rinseless washing, it's time to try the Optimum No Rinse Two Bucket Wash System. Rinseless washing is a safe alternative to washing the car the old fashioned way, particularly in the winter or in water-redistricted areas. Any time you can't access a water hose, you can use Optimum No Rinse Wash & Shine and a bucket - in this case, two buckets - of water to clean your vehicle. The second bucket allows you to employ the two bucket method. The two bucket method is a detailer's trick to minimize swirls that can occur from washing the car. One bucket has your wash solution. The second bucket has clean water. Every time you need to reload your sponge with wash solution, rinse the sponge in the clean water first before dunking the sponge in the wash solution. By doing so, you'll shake off most of the dirt into the plain water bucket where it's much less likely to get transferred back onto the vehicle. Savvy detailers have been using the two bucket method for years and now you can too with the Optimum No Rinse Two Bucket Wash System. Optimum No Rinse Wash & Shine is a multi-purpose product that serves as a rinseless wash, a quick detailer, and a clay lubricant, depending on the dilution ratio. You don’t have to be a chemist to formulate your own excellent car care products; just follow the directions on the bottle! As a rinseless wash, ONR removes dirt and grime as well as a traditional car wash, but it does not require rinsing. You can conserve water and still get your vehicle beautifully clean! These buckets are the basis of the two bucket system. They're deep, sturdy, and they hold plenty of fluid to wash a vehicle of any size. Inside each bucket, you'll find a Grit Guard Insert. The Grit Guard is a raised grid surface that sits in the bottom of the each bucket to trap dirt beneath it. When you dunk the wash sponge back into the bucket, drag it across the Grit Guard Insert to remove dirt that has accumulated in the sponge. The dirt will fall between the grid slats and settle in the bottom of the bucket. Even though you agitate the top water every time you put the sponge in the bucket, the Grit Guard stabilizes the water in the bottom of the bucket so the dirt does not rise. This thick, ultra porous wash sponge is cross-cut with channels to pull dirt away from the paint as you wash your car. The amazingly porous foam holds a tremendous amount of soapy water to lubricate and protect the paint. Cut-outs on each side make the sponge easy to grip with wet hands. These are great for any variety of detailing tasks, from general washing and drying, to applying and buffing off wax and quick detailers. Our microfiber detailing towels boast an 80/20 polyester/polyamide blend in a special “feather” weave that increases their absorption properties, guaranteeing high performance and durability. The Optimum No Rinse Two Bucket Wash System is ideal if you live in an apartment or condo and have no water hose access. If water restrictions are tight, you can still give your vehicle a good bath. 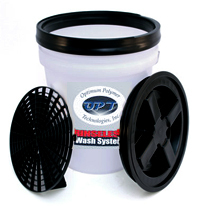 The Optimum No Rinse Two Bucket Wash System uses little water and still gets your vehicle beautifully clean. A total retail value of $130.88. Save $30.89! My first time with the rinse less car was system. It is so easy and the cars look the best they ever have. Highly recommend this system over water was. Had a chance to try this out on the car which was driven through rain and road grime the day before. There was a definie film of dirt on the car. It worked well to lift the stuck-on film from the paint and leave a nice clean surface. Note tht the car had a ceramic coating applied to it. ProsCleans well and does not scratch the paint, provided you use the wash and rinse buckets appropriately. ConsAlways try to dry with two microfiber towels; one to lift any dirty solution left on the surface and one to dry completely. Having no "dry" microfiber leaves spots. I washed my Lexus this weekend with the two bucket method and did not get one clear coat scratch. I recommend these supplies to anyone. The car is a daily driver, and it had a weeks worth (~300 mi) of dust / road film on the car (also rained). It is a white Jeep Liberty so it shows all the dirt and road film. I used the Rinse less wash method on my first wash. I put two gals of water and 1oz of ONR in the wash bucket, dumped in the microfiber towels. I let them soak while I cleaned the wheels using a two bucket method; I dont feel comfortable using rinse less on the wheels. I put 3 gal of water and the grit guard in the rinse bucket. I was worried that 5 cleaning towels and 1 drying towel would not be enough. By being careful to use all 8 sides, I had one towel left over. Once a towel came out of the wash bucket, it was never put into the wash bucket again. Used towels went in the rinse bucket and were agitated against the grit guard, and inspected to make sure they were mostly clean and ready for the laundry. When I was done the car came out spotless, and I had only used a quart of the wash solution. I screwed on the gamma seal lid and Im ready for the next rinse less wash. When I poured out the rinse water, I did it slowly to see if the grit guard actually did anything. Do this procedure once, and you will never wash a car without a grit guard; there was about a tea spoon of grit. Ask yourself if you would rub this over your paint. Towels were laundered, and came out spotless. I didnt use the sponge as that would have polluted the wash water, and I prefer using the towels anyway. For the second wash (a week later), I used the waterless wash method. First I cleaned the wheels using a two bucket method. I prepared the waterless wash (filled a 32 oz. sprayer with distilled water and added 2 oz. of ONR). I was worried that the car might have been too dirty to go waterless. To test, I sprayed a really dirty lower part of the car with the solution, and you could see it lift the dirt and film off the paint. Went slow and carful and the car came out perfect. I used all 32 oz. but Im sure I was a little heavy handed with the waterless was solution, as this was my first attempt at a waterless wash. I also learned that it works better (and is safer) to just very gently wipe, the ONR lifts the soil and the microfiber grabs just as well with very little pressure; reminded me of a California duster. ConsA little pricey, but a couple of clicks and you’re done; you don’t have to hunt the pieces down.